The CAN-DP series of protocol converter modules by Easysync (UK) has been extended. The EIA-232 module links PCs or embedded systems to CAN networks running up to 1 Mbit/s. THE SCOTTISH COMPANY IS SPECIALIZED IN USB communications and instrumentation systems. The recently introduced EIA-232 module comes in dual in-line package (DIP) form. It fits into 28-pin, 0,6-inch IC-sockets. Each CAN-DP module supports operation through both EIA-232 and transistor-transistor logic (TTL) serial interfaces. They can deal with speeds of up to 1Mbit/s on both their serial and CAN interfaces. The integrated electronics used by these modules includes a PIC18F4680 (8-bit) micro-controller with ECAN control function and 10-bit analog-to-digital converter, plus a MCP2551 CAN transceiver IC. 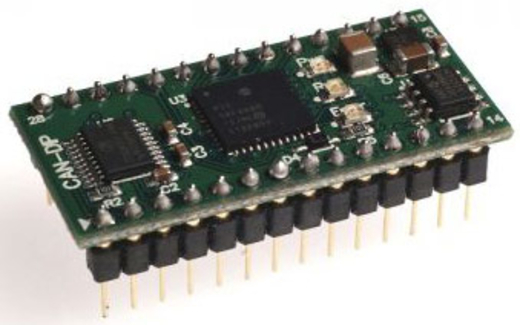 The MCU runs firmware that converts the data from its serial/UART format to the CAN protocol. The CAN transceiver IC converts logic level signals from the PIC micro-controller’s CAN interface into CAN physical signals compliant to ISO 11898-2. A set of three LED emitters incorporated into the module provides a visual indication of the CAN status. Communication is executed via ASCII commands passed to the CAN controller. The command set utilized is identical to the one employed by company’s S1-A-7001 RS232-to-CANbus adapter, allowing current designs based on that unit to be upgraded without necessitating any change in the software. The module can be powered by a +6 VDC to +15 VDC supply voltage. It is capable of supporting an operational temperature range from –40 ⁰C to +85 ⁰C and fits onto a compact 18,0 mm x 38,5 mm PCB (printed circuit board) in order to minimize required space. The pricing is 67 US-$ for single units and 57 US-$ each for 100 units. The supplier with sales offices in Europe and North America, established in 2001, offers also USB-to-CAN adapters.